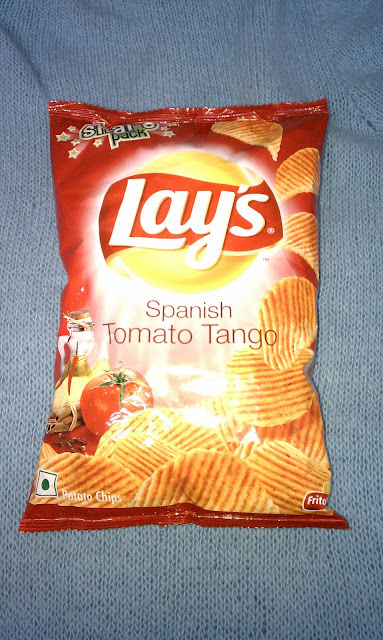 This next flavor of chips is Spanish Tomato Tango produced by Lays in India. 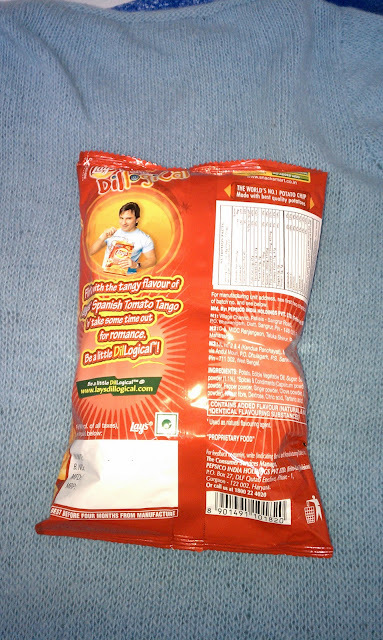 I got them at Patel Brother's supermarket. My expectations were pretty low when I got these, but they are much better than the Masala flavor. They are still a lot greasier than what I'm used to, but the flavor is really good. Lightly spiced katsup is the best way to describe it. Prawn cocktail being my favorite flavor, I am very pleased with the stronger and more complex tomato flavor. A glance at the ingredients reveals that there are a variety of spices in the seasoning that make it really tasty, like cinnamon, capsacum, and ginger. Cinnamon, Brilliant! 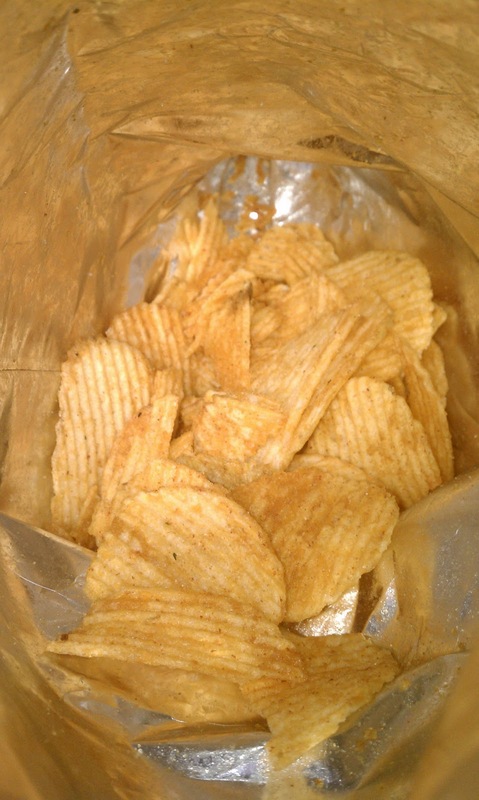 Next I'll be reviewing Walker's Cheese and Onion Crisps. On Monday, I finished my first original sweater, set in sleeves and all. The whole process was pretty easy, getting a true gauge swatch was the most difficult part. 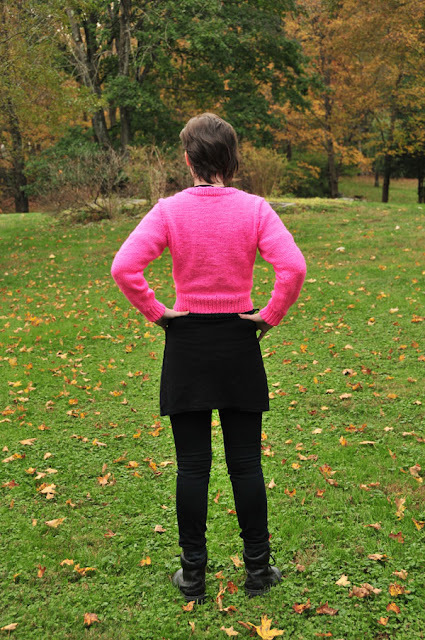 Here it is, a cropped sweater with a high neck and set in sleeves. After correcting the gauge confusion, I realized that only two skeins of red hear were needed, dropping the cost down to $6.00. Very reasonable for a custom fit sweater, and the hot pink color kind of makes the cheapness of the acrylic yarn acceptably synthetic. So for any of you who fit into a size small (34" bust), I've typed up the pattern. It's nothing special, but it would be cool to see other people make it. 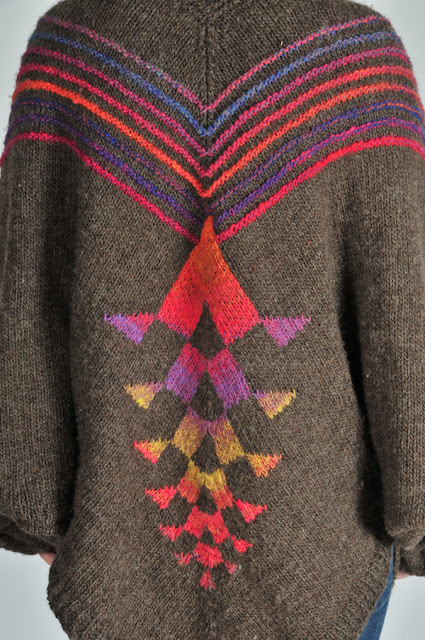 The sweater is 17" long, and ends at the waist. My apologies to anyone of another size, that's the next sweater project. You will need one front, one back, and two sleeves to make a full sweater. I added a one stitch selvedge to the edges of all pattern pieces to facilitate seaming. On size 6 needles, cast on 55 stitches. Work 20 rows of 1 x 1 ribbing. Switch to size 8 needles. K6, M1, K6, M1, K6, M1, K6, M1, K7, M1, K6, M1, K6, M1, K6, M1, K6 (63 stitches). Work 7 rows in stockinette stitch. K16, M1, K31, M1, K16. Work 7 rows in stockinette stitch. K16, M1, K33, M1, K16. Work 7 rows in stockinette stitch. K16, M1, K35, M1, K16. Work 7 rows in stockinette stitch. K16, M1, K37, M1, K16. Work 7 rows in stockinette stitch. K16, M1, K39, M1, K16. Work 7 rows in stockinette stitch. Bind off 3, knit to end. Bind off 3, purl to end. Work 18 rows in stockinette stitch. K23, bind off 13, K23. Bind off 1, K16. Work 3 rows in stockinette stitch. Work 30 rows in stockinette stitch. Bind off 5, K16, Bind off 17, knit to end. On size 6 needles, cast on 31 stitches. K1, *M1, K1, repeat from * to end. Work 7 rows of stockinette stitch. Bind off 2, knit to end. Bind off 2, purl to end. Sew shoulders, attach sleeves, then sew side seams. Pick up 70 stitches around the neck using double pointed or circular needles. Share pictures if you make one. "The puritanical, Catholic approach of 'less is more' is wrong because we know all Catholics are sinners." This is not a breakfast recipe, this is a recipe to break your fast. I made this two days ago for Yom Kippur dinner. 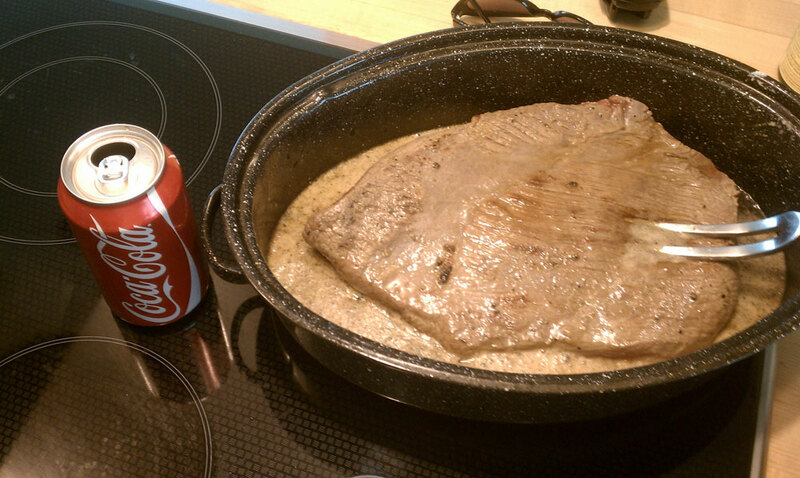 It is a modification of a friend's family recipe, adding the one ingredient that tenderizes and seasons a brisket like nothing else: Coca Cola. Preheat the oven to 325° F. Preparation and cooking will take 5 hours and will feed a bunch of people. Chop the celery and carrots into half inch pieces. Slice the onion into quarter inch cubes. Set the vegetables aside for later. Rub the brisket on both sides with salt, pepper, and garlic powder. I don't measure my spices, but I know that I can always add more later, but I can't remove excess seasoning. Put your roasting pan on the stove, and add some cooking oil, just enough to keep the meat from sticking to the pan. Braise the brisket on high heat until the meat is slightly browned on both sides. Pour the can of soda over the meat. Add the vegetables, thyme (preferably fresh), bay leaves, and the katsup. Make sure the brisket is laying fat side up, usually there will be one side with a thick layer of fat. Put the pan into the oven for 3 hours with a lid. Chop your potatoes into pieces, no larger than one inch, and add them at the 3 hour point. 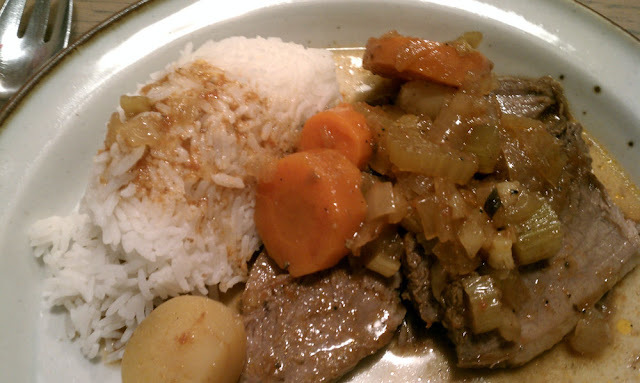 After a half an hour, turn off the heat, but leave the pot roast to cook for another half hour. 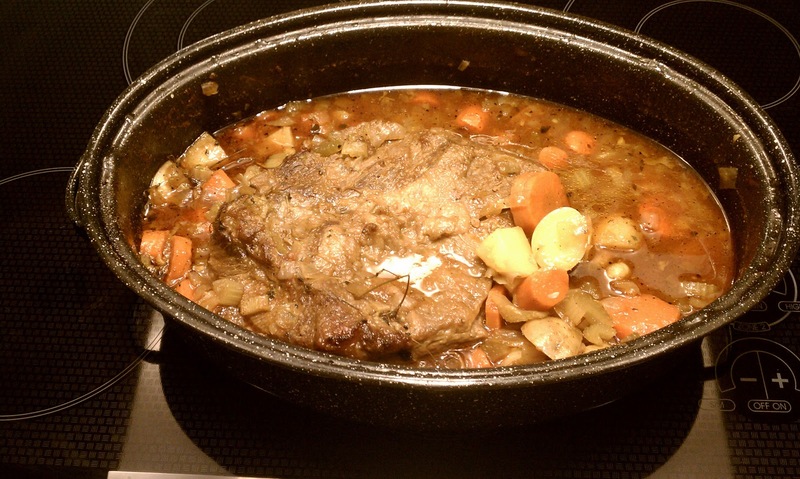 Remove the pot roast from the oven and let it rest for 15 minutes in the gravy. The meat will still be warm when you slice and serve it with a side of rice, noodles, or mashed potatoes. Om nom, leftovers will make delicious sandwiches. You may remember A while ago I asked for some help with a pattern that I came up with. After a little help from the ravelry community, I figured out how to chart this thing. The color came first, but after I uploaded the simple chart, people started to ask for the full poncho pattern. 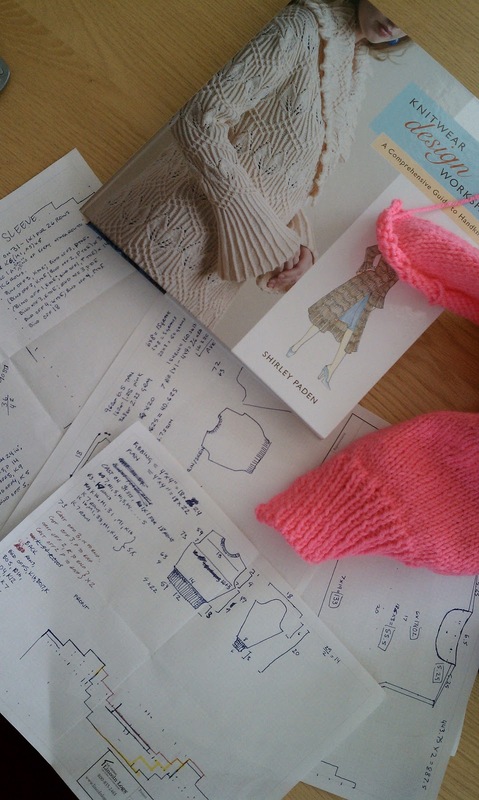 This PDF is a diagrammed chart of the whole poncho. I don't want to write it out line by line because the pattern is very simple and easy to understand once you see it laid out. It's just a really big mitered piece. 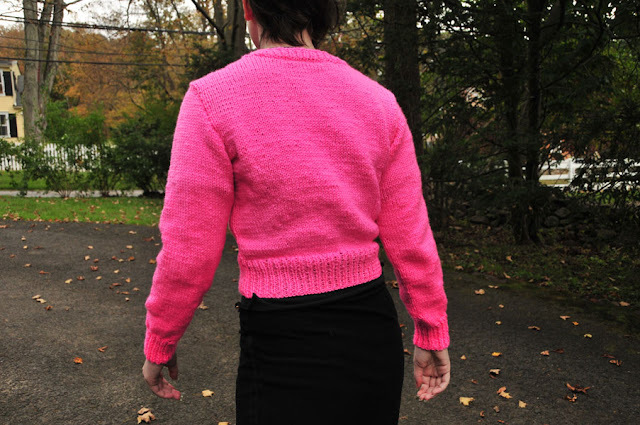 For me, this was a stash buster, using up a bunch of yarn that was really warm and a bit itchy, good for a jacket type project. I never wrote down the yardage, so the file might be a little low on the amount needed of the main color. Unfortunately, I do not have the resources right now to test this pattern before posting it, but I am sure any corrections or notes will be easily fixed once people start to make it. If you find one, just let me know in the comments section and I'll modify the file.